For rice, combine dry rice, one can of coconut milk and 1 cup of water in a rice cooker or a large pot. Bring to a boil, then low on simmer, covered for about 20-25 minutes until fully cooked. Fluff with a fork and season with salt. Set aside. In a heavy bottomed large pan, heat coconut oil. Add garlic, onion and ginger, sauté until fragrant but not browned, about 3 minutes. Add all chopped veggies and sauté until tender but still slightly crunchy, about 5-7 minutes. Season with Tamari Sauce and salt to your liking. Transfer rice to a large bowl and arrange lettuce cups on a serving platter. 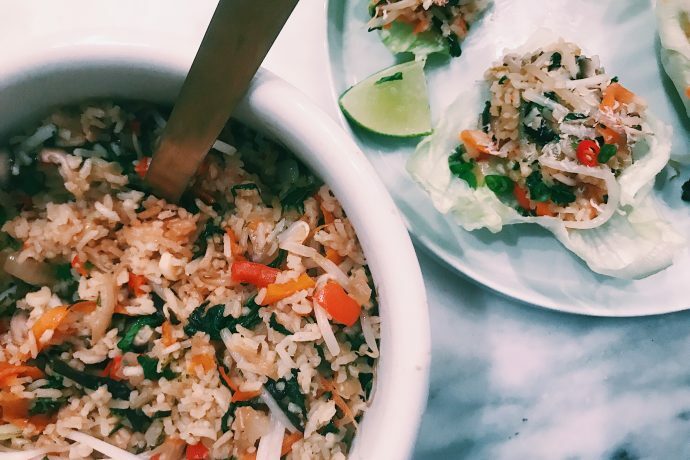 Garnish with fresh cilantro and mint as some shredded coconut with lime wedges on the side. Let people serve themselves!